I had an appointment for week 32, which like the others, was pretty much normal. However, I found out that the next time we would get to do another ultrasound - something I LOVE to do! Also, it happened that the doctor was going to be out of town in 2 weeks, so I had to come back a week early - I was so disappointed :). 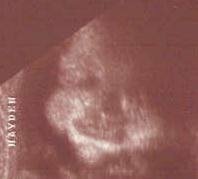 So, when I went back at week 33, we got to do an ultrasound. The boys are getting really big, so it is difficult to see the ultrasound pictures very good, but I am posting them anyway. We got a good picture of Hayden's face (picture on the left below), and part of Carson's face (picture on the right below). Everything is going good. They estimated Hayden's weight to be 5 pounds, 2 ounces, and Carson's weight to be 4 pounds, 13 ounces. That makes us very happy and further justifies why they feel so heavy and why I feel so tired easily. The doctor said that I had dilated 1 centimeter, but that wasn't uncommon. However, he does want me to do as little as possible. He said that he wasn't going to say "bed rest," but that I should spend the majority of my days resting. I am having a little difficulty with that, but am getting better I think :). I am now doing most of my work from home, only a couple of days a week, so I think it is manageable. I am swelling quite a bit now, but my blood pressure continues to be good, so he is not worried about it. The goal right now is to make it to week 35 (I still want 36 or 37), which is Tuesday, June 13. If we make it that far, they say they won't send us to Little Rock to deliver the boys. That is 6 days from now, so hopefully I can make it! I will go back to the doctor on the 14th and will keep you updated. Also, some people have asked about an updated picture of me. Well, here it is. This was at 32 weeks. I just love checking up on the progress that Hayden and Carson are making each week. Christy you look adorable. Your pregnancy pictures are fabulous, Im glad you decided to do that...I wish that I had done that with my two boys, but like you, just didnt want pictures of my belly. Keep resting and staying pregnant for as long as possible... Good luck and keep us all posted. Christy, dear, your Auntie Adele is so PLEASED that the boys are that large! As a pediatrician, I can tell you that at this point there should be no problems. I am ecstatic that you have done so well and carried them for so long -every day now is just icing on the cake. Much as I would like to have you down here in Little Rock (where I could protect them), being able to deliver "normally" there in Jonesboro would mean no problems are anticipated, and that is best. I went to the Grand Canyon last week and brought back two Junior Park Ranger outfits for the boys. Now, if we could just get Phillip to dress up in a bear costume when they wear them . . . I'll be in over Father's Day weekend and would love to be able to see you. I have great confidence you will still be nuturing them safely inside then.